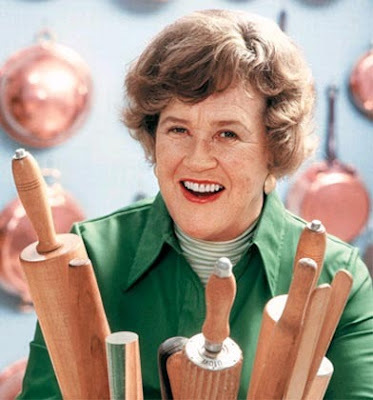 I am not a French cook and I don't rely heavily on Julia Child's recipes in my own kitchen. But the 'Julia hype' was all over the blogs, the magazines and the airwaves this month and for good reason. When I got to thinking about how she influenced me just by who she was and what she did, I realized I, too, just had to pay tribute. After all, she didn't start to learn to cook until she was 37 years old and when I read this in her memoir two years ago, it is one of the things that motivated me to start this blog and devote so many hours to learning and cooking and experimenting over the last two years in my own kitchen. 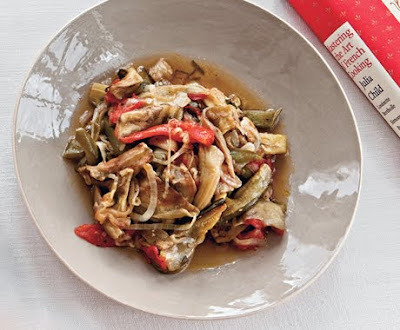 That summer I also read Julie Powell's book, Julie and Julia, and loved it. She seemed like a girl after my own heart. Julia's birthday was on Aug. 15, coinciding nicely with the release of the new film Julie and Julia, based on these two books. I went to see the movie on the afternoon of its opening day. I took myself as a treat and sat there in the overly-air-conditioned movie theater on a hot summer day, smiling and crying and thoroughly enjoying myself. 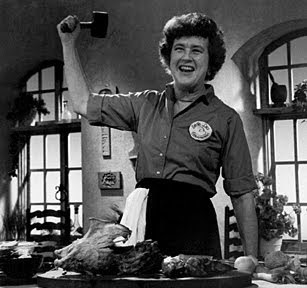 I loved the scenes shot in Paris in the markets and Meryl Streep's impersonation was almost as good as watching old footage of Julia Child's early TV program, The French Chef. I watched those, too, last week on PBS, experiencing her for the first time in the original format and fell in love with her all over again. So, I decided since I was having people over for dinner one night last week, why not combine our dinner party with one of Julia's menus for a celebration in her honor. I used the recent bon appetit article from the August issue as my inspiration (with links to those recipes here). Even though I have Julia's Mastering the Art of French Cooking, I seem to read it more like a textbook than actually cooking from it. There is something about it that is so technical but also so accessible and I can see why it was such a seminal cookbook that enjoyed 47 editions! This menu started out with this beautiful, flaky tart, a pissaladière nicoise. It really was a delicious crust and the salty anchovies, black olives and sautéed onions were a classic combination. It was a basic pate brisèe tart crust, but in addition to the butter, there were 2 tablespoons of chilled vegetable shortening--not my usual fare, but it really did make for a flaky and beautiful tart crust. The main course was poulet sautè aux herbes de Provence. In true Julia form, I bought a whole organic chicken from the market and cut it up into eight pieces myself. I was proud of myself for doing that, as if it were some major accomplishment. But really, growing up in the age of ready-made and plastic-wrapped everything, it makes me feel self-sufficient and somehow cool to be able to save money by buying a nice chicken and cutting it up myself. It came out great. As you can probably guess, the distinguishing factor of this preparation is the use of traditional herbs like thyme, basil and fennel seeds, plus garlic, and sautèeing the chicken pieces in a whole stick of butter. It was delicious, subtle in flavor, moist and had good color due to the browning in butter. The sauce was a little too French for my tastes, combining egg yolks whisked with wine and lemon juice over low heat while adding the reserved pan juices a little at a time. It tasted and looked heavy to me and I ended up serving it on the side instead of pouring it over the chicken. But everyone loved it. I also made Julia's Ratatouille recipe (above), which involves more steps than the one I usually make, but it was nice and fragrant and more of a stew than usual. I liked it, but it was no big revelation. The season is right for it though, and I just happened to have a large purple eggplant, peppers and tomatoes from the garden and I used yellow squash instead of the zucchini the recipe called for. I don't think it would have made a big difference. I served a simple green salad with vinaigrette and a basket of crusty French bread on the side. We drank a lovely French chardonnay and I served a sample of locally made artisan chocolate from the new Olive and Sinclair chocolate company for dessert. It was a simple and fun meal, one that I am not likely to make again soon, but a fitting tribute to a woman who certainly inspired me and who, almost fifty years later, continues to inspire so many cooks around the world. Thank you, Julia! There is something to be said for keeping traditions alive, even when times are tough. For example, the East Nashville Tomato Art Fest went off without a hitch and was the most well-attended in their 6 year history, despite the beastly temperatures on August 8th. And, although it's mid August and we should be deep into tomatoes by now, many (including mine except for a few early ones) are languishing on the vine, refusing to ripen. Our farmer who supplies our CSA says he lost over 600 tomato plants this year due to a 'blight' - the same one perhaps that seems to have affected the crops all over the Northeast. One of the perils of organic farming is that refusing to use pesticides and chemical fertilizers can also mean losing an entire crop. But all of this was not enough to stop Connie Adams of Memphis, TN. My good friend Galloway's mother, Connie was one of the first people I met when I arrived in the South four years ago, on my move from Colorado to Nashville. She welcomed me into her home and what a home it was. It was August then too and her kitchen was filled with women of all ages, suited up in aprons and deep into Tomato Time, the traditional canning party that takes place at Connie's every year at this time. 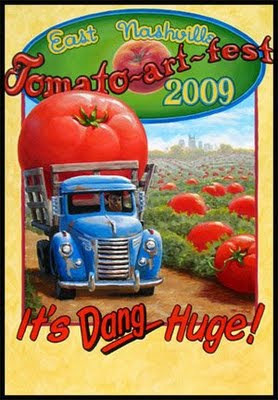 It's been going on for more than 20 years now and every August family members--children, nieces, grandmothers, aunts and cousins-- and friends old and new get together to put up hundreds of jars of tomatoes over four days in what has to be one of the best food traditions in the South. After that first time I told myself I had to come back and learn from these women. So this year, when Connie invited me to come, I didn't hesitate to accept her invitation. Now that food and its preparation is becoming more and more an integral part of my life, I was more excited than ever to learn how to can tomatoes from these professionals. And what I learned was valuable in more ways than one. I learned that you can't stuff the jars too tight or they may break in the boiling water. I learned that having the proper equipment is very important. And I learned that the more hands you have, the more fun-- and efficient-- the work is. Canning is definitely not a one or two person job. I remember stories about my great Aunt Kate and Uncle Les who canned everything in their basement in Colorado, just the two of them. Every year for Christmas they'd bring my mom beautiful jars of tomatoes, peaches, pears, pickles and anything else they had that year. While I knew that my family was always delighted to empty out their contents, I never understood the amount of work that went into those jars until now. We worked hard over those days, all the while talking --about books, about friendships, about family and kids. Mostly I listened, just soaking up the history that was in that room, happy to be cutting, peeling, stuffing or boiling tomatoes in the company of others--of all ages--who were all so happy to be there. And orchestrating it all from her perch at the stove, running circles around us and making extra trips to the farmer's market each day for fresh tomatoes, checking each and every jar for air bubbles and making us re-do them if she found them, was Connie. She is the master of the ceremony, the Tomato Queen of Memphis. And now, looking at the fruits of our labor, I understand why she does it: almost 400 jars of tomatoes in 4 days, each one more perfect than the next, a lasting memory of time spent together in the kitchen. What better kind of tradition is there? August is always a mixed bag for me. This is because it brings all kinds of contradictory emotions wrapped up in one month. Maybe because I have spent the better part of my life until recently working in the academic world, and as soon as August rolls around the dread of going back to school creeps in and makes me realize that summer is almost over. On the other hand, I was always a very eager student who actually looked forward to going back to school and couldn't wait to show off her new school clothes and meet her new teachers. (I know, geek alert). Now that the academic calendar no longer rules my life, I still have remnants of the mixed desire/dread that plagued me for so many years. It's like a learned reaction that I can't quite kick. I dread that summer is almost over and I feel like I haven't done enough canning, preserving, traveling, swimming, biking, etc. And pretty soon it will be winter. I mean, it's almost Christmas! (can you see where this is headed?) On the other hand, I love the month of August for its mixture of carefree summer days and the promise and potential of new beginnings that lie just around the corner. Oh, and what would August be without those beautiful, shiny, irregular homegrown tomatoes? I am lucky to live in a place that not only prides itself on its tomato crop, with many different heirloom varieties in all of the farmer's markets right now, but it seems that every single person in my neighborhood has a few tomato plants in the backyard. One cute elderly woman even sells hers on a folding table in her front yard. The sign reads "homegrown tomatoes for sale." 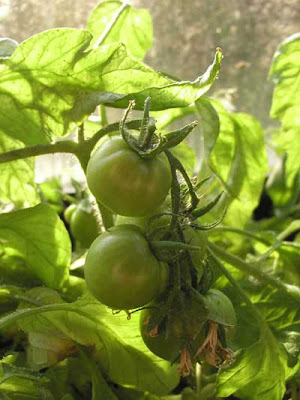 Even if there is no garden to speak of, there are a few tomato plants in everyone's backyard off in a sunny corner, promising a tasty month of homegrown goodness. 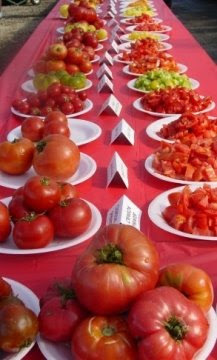 We even have our very own Tomato Festival in East Nashville -- the premiere neighborhood event of the year. It's next weekend and I can't wait! So what do I do with my tomatoes? I posted about the soup last time, but usually I do something much simpler that involves no cooking. A simple caprese salad if I can find fresh mozzarella, because together with the tomatoes, I have basil coming out of my ears right now. Or, I boil some water, throw in some thin spaghetti and toss the hot pasta with roughly chopped fresh tomatoes, basil, two cloves of minced garlic, some capers and a few black olives if I have them, a splash of balsamic vinegar and the best olive oil I can find. It's my man's favorite use of tomatoes. I have to agree. I can honestly say that if it weren't for Tennessee tomatoes, I would be rather blue this month. There is something missing in my life and that may be the student/teacher in me speaking. But, if I can't go back to school, I can at least get into the fun that August always brings and be grateful for the celebration of a perfect fruit. So...tell us. What do you do with your tomatoes?